With Valentine’s Day around the corner, you might be looking for some cute treats or desserts to make this year. We have rounded up some of our favorite Valentines Day Treats all in one place. It doesn’t get any better! We’re of the firm belief that you don’t need to be in a relationship to celebrate Valentine’s day. You can celebrate love of any kind, including those you have for family and friends. We often get so busy in our daily lives that we don’t always show appreciation to the ones we love. So why not take Valentines day to show some of the appreciation and love we feel but often don’t express. 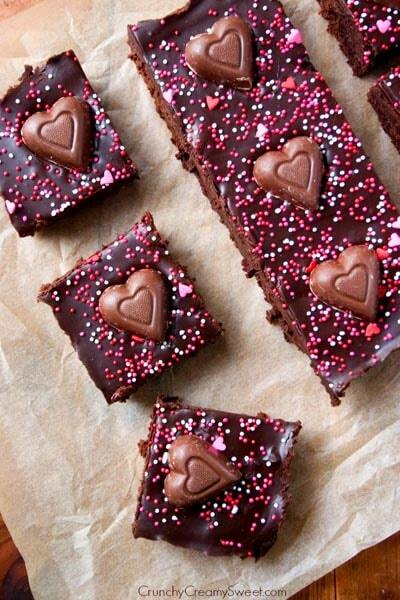 Spoil your loved ones with some of these yummy Valentines Day Treats this year! To view the full recipe and instructions for any of these Valentines Day Treats, please click on the link below the image of the recipe you like. Hope you enjoy! Take an iconic Valentine’s Day candy Conversation Hearts and turn them into a fun Valentine’s Day treat that we call Conversation Hearts Pretzel Bites. 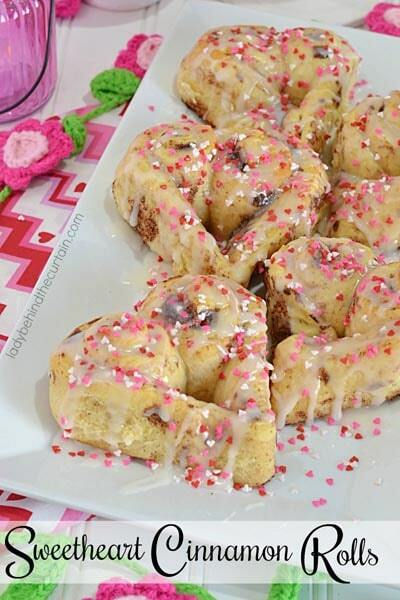 Using store bought cinnamon rolls is all you need to create these fun festive Valentine’s Day treats. Have an office meeting coming up? Treat the staff to these cinnamon rolls! Who says cinnamon rolls are only for breakfast. Not us! Here’s a Valentine’s treat that is super easy, and perfect to send along with your little sweeties to share with their friends. 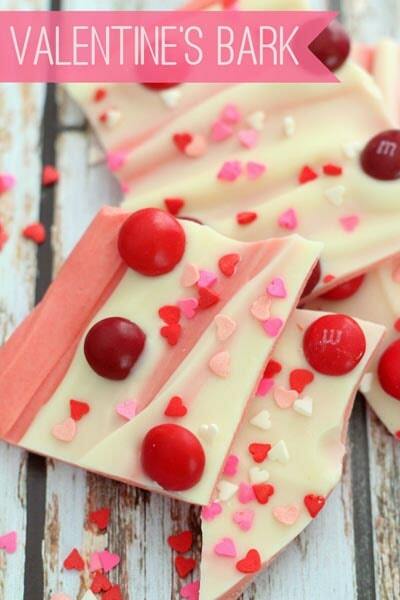 Easy and Delicious Valentine’s Bark. Ingredients include vanilla candy coating, cherry m&m’s, and sprinkles! The only warning that should come with these cookies is that they can make your mouth red, so the little ones might get a bit messy! 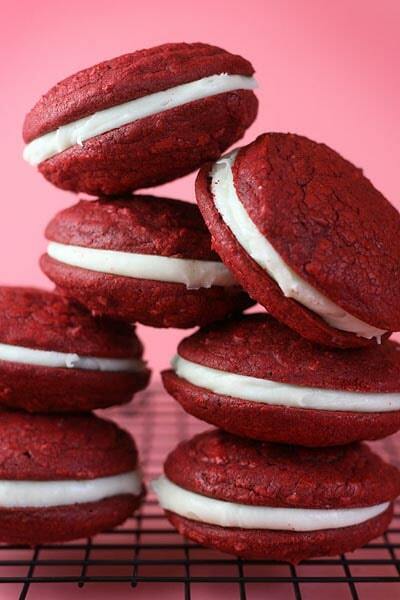 Nonetheless, they are the perfect red treat for at least 2 holidays out of the year! 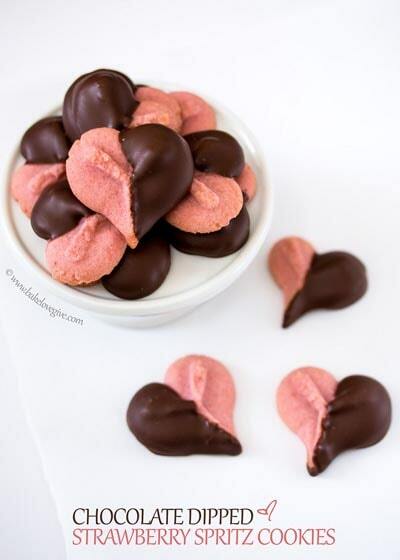 Valentine’s Day Chocolate Chip Cookie Hearts are the perfect easy Valentine’s Day dessert! Easy to make using pre-made cookie dough or your favorite cookie recipe! 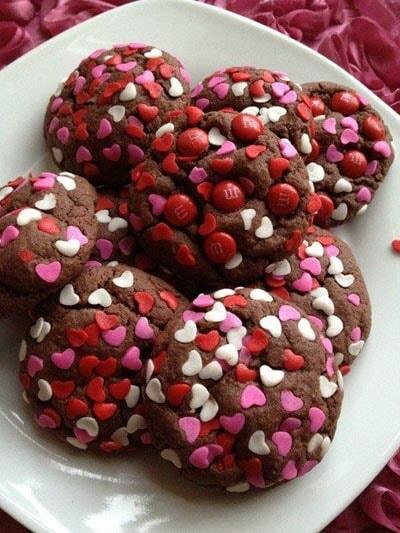 These heart shaped cookies will be your new go-to Valentine’s Day treat! We know these seem a little bit on the harder side to make, but we promise they’re simpler than they look! 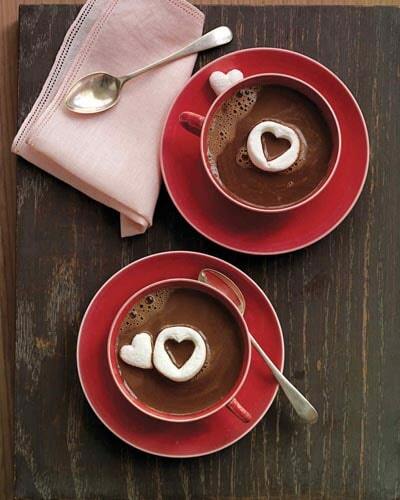 Nothing says “I love you” like a warm mug of chocolate with floating marshmallow hearts. The Valentine’s Day Pretzel Treats are perfect for some special time in the kitchen with kids and even an affordable treat to make and take to school parties. We’re seriously in love with these M&M’S Cookie Bars! 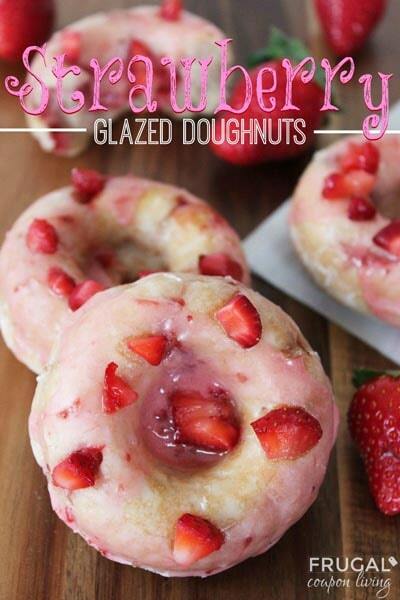 They are so pretty and easy to make and the very best part is they are perfectly delicious! This Valentine’s Day Chocolate Covered Strawberries recipe is an easy way to make this romantic and pretty treat at home. Fudge Brownies with Chocolate Ganache – my favorite brownie base, topped with easy ganache and decorated Valentine’s Day style! The fun part of this recipe? Thanks to the candy makers all finding holidays fun for products, you can make this mix for every holiday and for no reason at all! 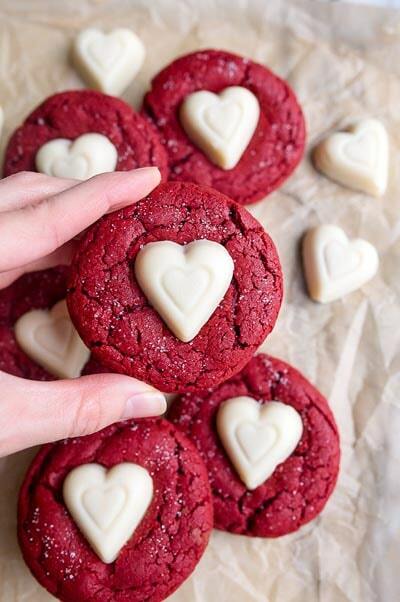 Small batch sugar cookies: red velvet sugar cookies with hearts for Valentine’s Day! 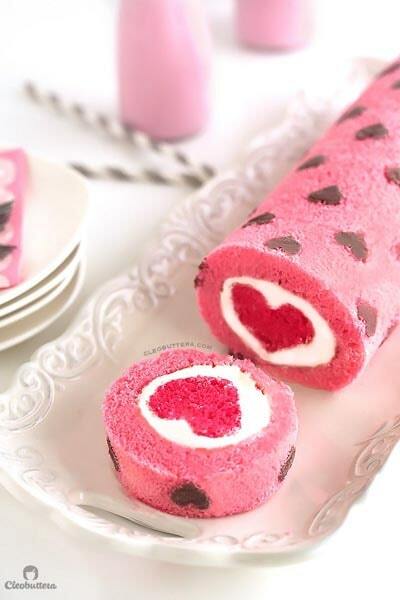 Heart-patterned cake roll made easier with a CAKE MIX! It is filled with a cloud-like whipped cream cheese frosting, and unveils a cute ‘lil heart with every slice. 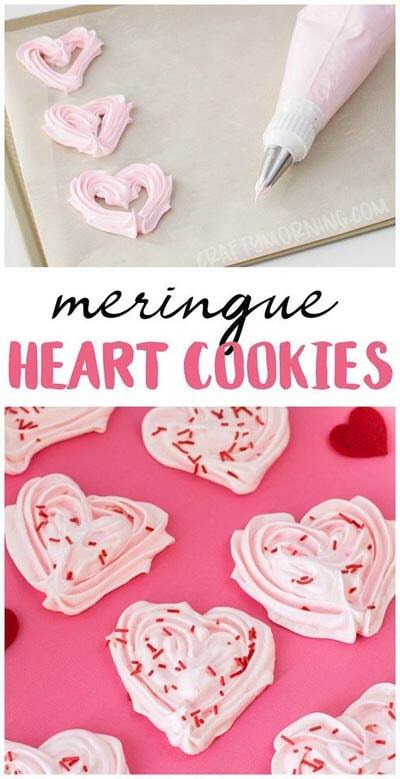 Make these gorgeous meringue heart cookies for a valentines day treat dessert idea. Also learn how to pipe hearts with meringue. It makes a fun gift! 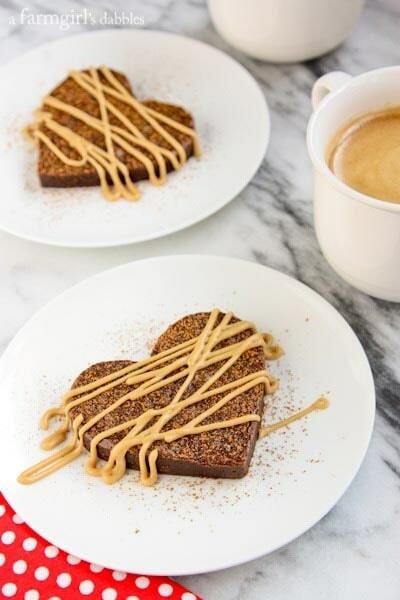 If dark chocolate fudgy brownies are your thing, you simply must give these Fudgy Brownie Hearts with Espresso Glaze a try! 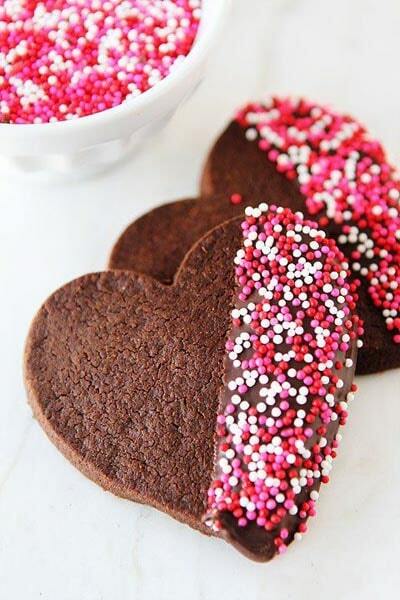 Crisp and buttery Chocolate Shortbread Heart Cookies that get dipped in chocolate! Give your friends and family a fun and loving surprise in every slice of this Valentine’s Day Peek A Boo Heart pound cake! 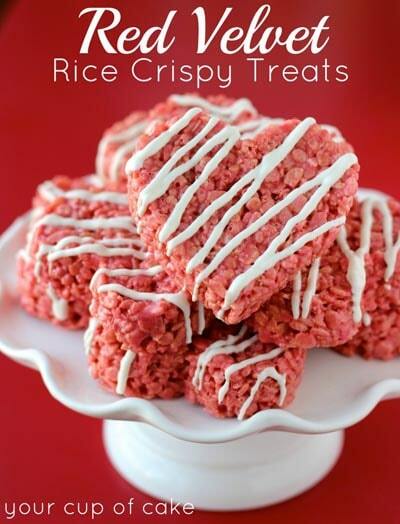 XOXO Rice Krispie Treats are a sweet and delicious Valentine’s dessert that will show your family that you love them on Valentine’s Day. These marbled red velvet cheesecake brownies look just adorable. And they’re pretty easy to make too! These easy, no-mixer brownie bars are in between a bar and a brownie. Not supremely fudgy to give them true brownie status, but much fudgier and richer than your typical bar, and not cakey. They’re smooth, rich, dense, and supremely moist. Strawberry jam gives the classic spritz cookie a kiss of natural strawberry flavor while a quick dip in rich dark chocolate makes these cookies just perfect for Valentine’s day. 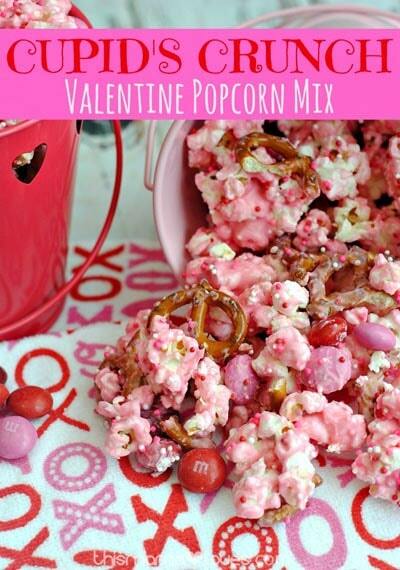 This Valentine’s Day Popcorn recipe is quite easy to make. It only takes a few minutes, but the results are a fun Valentine Treat both kids and adults will enjoy. They are super soft, almost a cross between a fudgy brownie and a chewy cookie. You may leave them plain or roll them in some festive sprinkles, like these tiny hearts for Valentine’s Day. They are sweet and red and a perfect little treat to give on the 14th. And even better, they are super-easy! 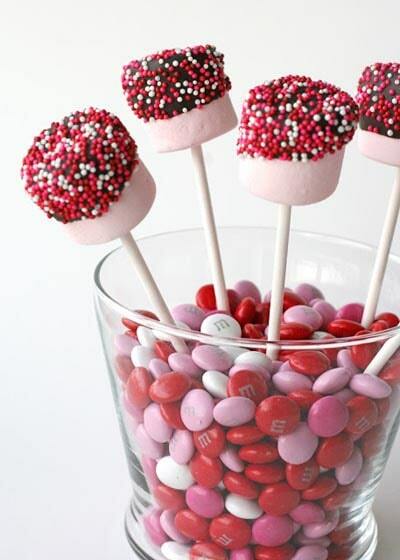 These Valentine Fruit Wands are so cute and perfect for a healthy treat! Great snack for the kids any time of year! Delish Hot & Spicy Cinnamon Oreos dressed to impress for Valentine’s Day. 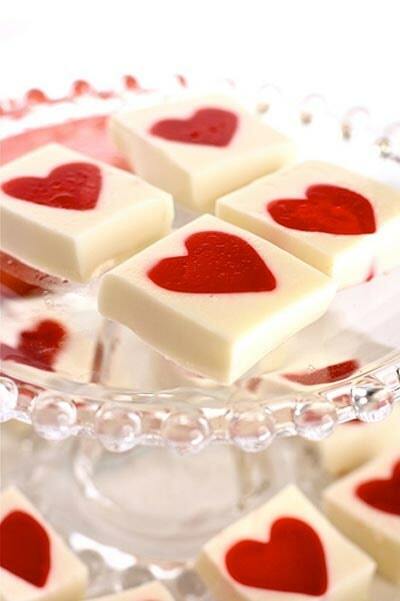 These White Chocolate Bark Bites will look adorable packaged up for Valentine’s Day gift giving! 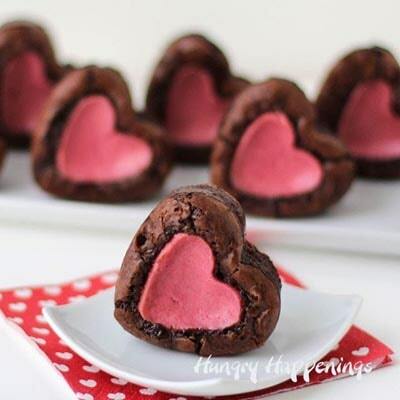 Make your significant other fall in love with you all over again by making them these Raspberry Cheesecake Stuffed Brownie Hearts. Each heat shaped brownie has a smaller raspberry cheesecake brownie stuffed inside. Rice Crispy (Krispie) treats have always been a huge weakness for me. 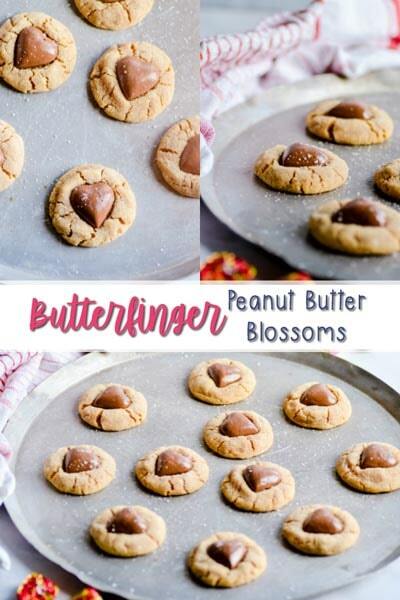 Simple 4-ingredient peanut butter blossoms made with Butterfinger hearts. 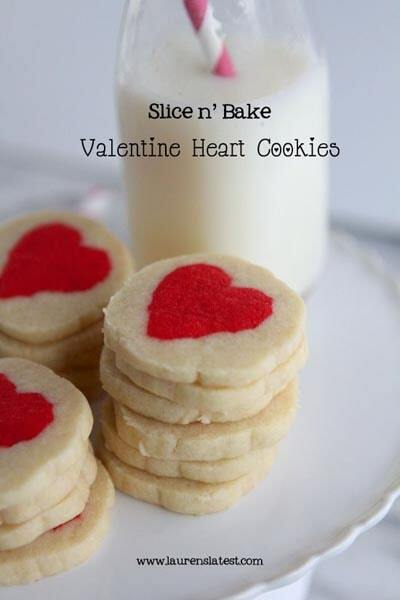 This my favorite Valentine’s day cookie, and we make them every year! These cute Valentine’s Day Oreo pops take only a few minutes to make, and they make a great classroom treat idea for your friends! Have you ever turned a cinnamon roll into a heart? It’s super easy. Then you can stick them on sticks, tint the icing pink, bathe them in sprinkles, and you have a pink puffy heart heart cinnamon roll. A fun jello dessert that kids can help with! 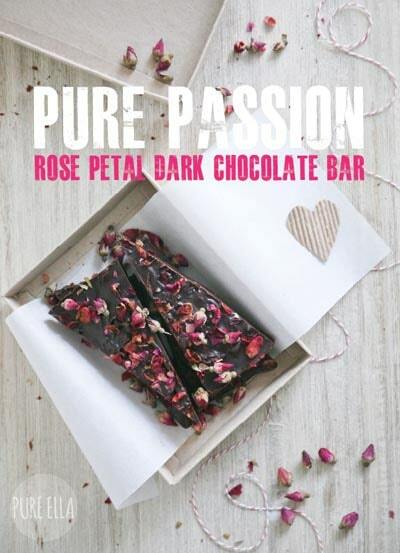 This is the most beautiful homemade aphrodisiac chocolate bar that’s topped with natural rose petals! Chocolate covered pretzels might be my all time favorite treat to make and share. They are SO darn easy to make, there is no baking, the options for customizing them are endless and with their delicious sweet and salty crunch, everyone always loves them. They are a perfect treat and go great with Ice Cream! This is an easy bake at home recipe and best of all you don’t have to feel guilty because these desserts are baked, not fried! 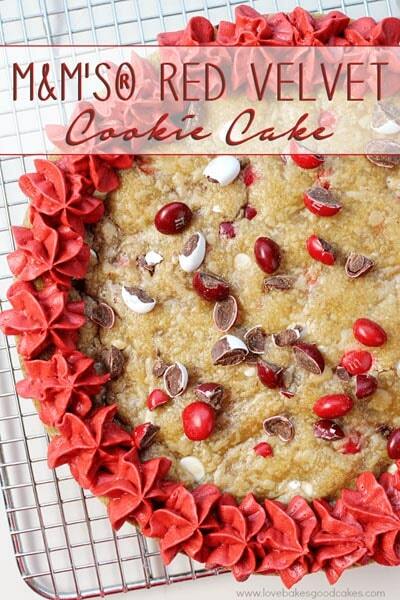 This show-stopping M&M’s® Red Velvet Cookie Cake is perfect for Valentine’s Day! This giant cookie is loaded with M&M’s® Red Velvet chocolate candies and a from-scratch Red Velvet Buttercream Frosting! 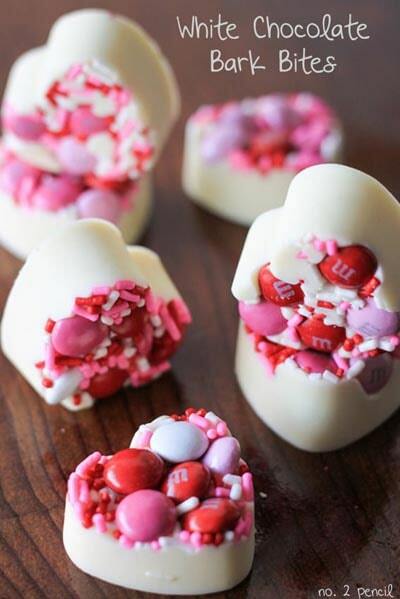 Pin these Valentines Day Treats for later! 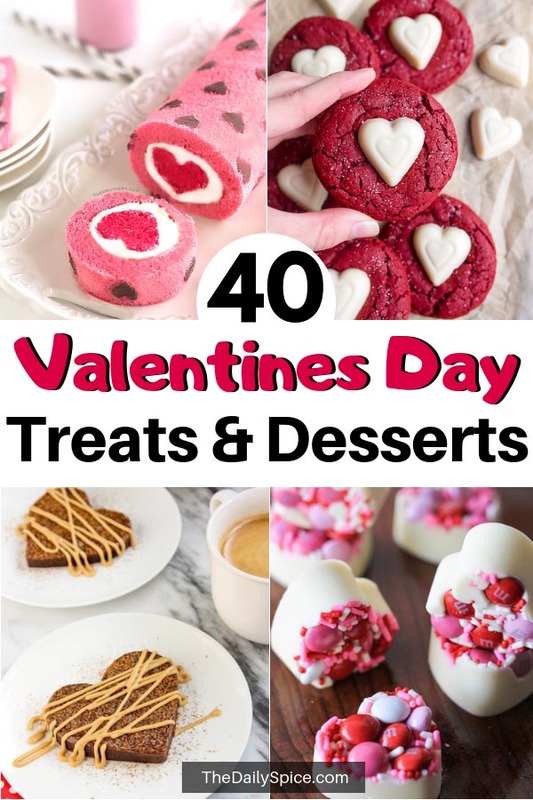 If you enjoyed this roundup of Valentines Day Treats, please take a moment to pin it to your Valentines board on Pinterest, it would make our day!